"I enjoyed reading it and by the end of the book the author had convinced me of the importance of the topic and encouraged me to think about how to enhance church diversity, asked some insightful questions and pointed me to some extra reading, but I would have loved more “how to” advice about doing leadership differently for culturally diverse contexts." I read this book on American church diversity as an Australian pastor, but we face a similar increasingly globalised and culturally diverse ministry context. The main growing edge of the church in Australia, as for much of the Western world, are our languages other than English congregations, and there is increasing interest in distinctly multicultural models of church. But some of our biggest challenges relate to cultural diversity - how do pastors of culturally diverse churches help different cultural groups to worship and serve together, how do we create spaces of hospitality for cultural diversity - nationally and for churches, how do we connect churches best with second generation migrants, how do we train culturally diverse leaders for mission, how can pastors and churches of different cultural groups serve together and learn from one another? There is a lot we could learn from culturally diverse congregations and leaders in North America. I am intrigued by read elsewhere about the “2040 reality” in the US that will see the white population dip below half, and cultural minorities become the majority. So I was eager to read Ken Walden’s advice from his experience and snapshot of the North American scene. Ken Walden has served as university chaplain, university professor, military chaplain and senor chaplain including various cross-racial and multi-cultural ministries - as an African-American pastor often of predominantly Caucasian churches, or of multiple ethnic congregations in the church. He offers a practical theology response to the challenge of pastoring in cross-racial and multicultural contexts; that is, what it is like and how can pastors best prepare and serve for contexts where their cultural background is different from their congregation? Practical Theology for Church Diversity gives an overview of cultural diversity in US and emphasises the importance of preparing well for cross-racial ministry with self-examination about ethnicity, discussion with mentors, prayer and carefully constructed conversations with church committee and members. It includes vignettes of what is involved for pastors experiencing a welcome introduction and suggests team building or get-to-know-you activities, and offers good general advice on starting well (for example, learn everyone’s name, learn the church history, be careful about what you change). The best chapter for me was on church collaborations, urging and modelling how to encourage people of different cultural groups to work together within and across different churches. These are essential skills for churches existing in our global village. A later chapter identifies problems of miscommunication, territorial conflict and identity crisis to watch out for. The book is full of good advice, although much of it reads like good general advice for any pastor starting anywhere. I enjoyed reading it and by the end of the book the author had convinced me of the importance of the topic and encouraged me to think about how to enhance church diversity, asked some insightful questions and pointed me to some extra reading, but I would have loved more “how to” advice about doing leadership differently for culturally diverse contexts. For example, the book refers to excellent diversity training offered by hospitals and emergency services, but I would love to read the author’s analysis of what that looks like or what it could be like in churches? It recommends becoming familiar with different religious customs, but offers limited examples of what to look for or how to develop intercultural intelligence. Comments on theological education verge on a rant against institutions for not preparing students well for intercultural ministry but with minimal suggestions of how they could do better. The author has a wealth of experience in this ministry area and I resonated with his heart and appeal for the importance of this topic, but I would have loved to have read more about his experiences and reflection on practical theology implications of how others could learn to do culturally diverse ministry in fresh ways. The book is a concise 128 pages and as such is a good introduction to the issues with good questions to ask and further reading for anyone considering or engaged in culturally diverse ministry. This review was originally published in Practical Theology 9:1 (March 2016), 95-96. 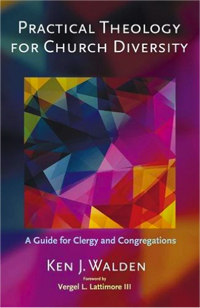 To buy this book, follow this link - Practical Theology for Church Diversity: A Guide for Clergy and Congregations .